Te Awa winery on the Gimblett Gravels in Hawke’s Bay, New Zealand, have been making excellent Pinotage since 1993 but no more. 2010 was their last Pinotage vintage. The vineyards lining the driveway to the winery have a gap in them where seven rows of Pinotage vines used to be. They’ve been pulled up, but nothing has yet taken their place. 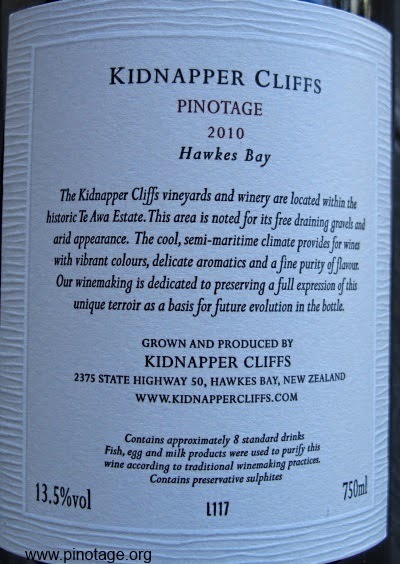 I bought one of the last bottles from just a handful of remaining 2010 premium Kidnapper’s Cliff label which comes in a statement heavy bottle, closed with a cork sealed with red wax and thick textured paper labels. The wine is dense and powerful with a berry nose, medium bodied with soft tannins and hint of toffee and chocolate. There are a reducing number of New Zealand Pinotages being produced and Te Awa made one of the best. 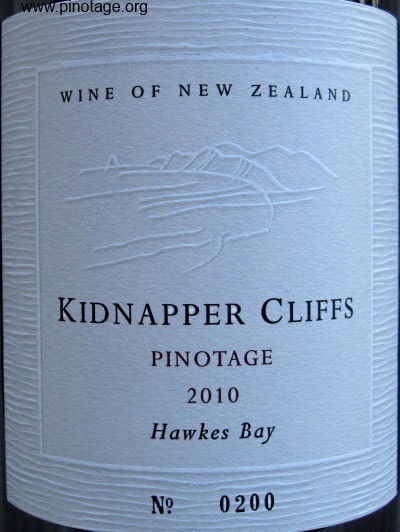 Pinotage sceptic Jamie Goode awarded the 2009 Kidnapper Cliffs Pinotage 91 points, the 2010 won Double Gold at the 5 Nations Challenge, Bob Campbell, MW, rated 2010 4/5 stars and there are many positive reviews on the web.